Length: 7 hours, 28 minutes. Unabridged. I read and reviewed the first two titles (Truth Stained Lies and Distortion) in this series a long while ago, and somehow never got around to finishing the series until recently. When I stumbled onto this one available as an audiobook on Hoopla through my local library, I figured it was time to finish what I’d started. And yes, I’m glad that I did. This novel wraps up many loose ends from the first two books, and takes the perspective of a character who wasn’t always seen in the best light in the earlier books, and turns her life around. Wow. Some very meaningful themes throughout the book, including a strong redemptive storyline. While Creed, the hero, doesn’t start out as a terribly appealing character, the author does a good job changing our perceptions of him over the course of the book and making him sympathetic to Holly and to the reader, until by the end, we’re rooting for them and their relationship. Overall, a good conclusion to the series. And the author’s note at the end is well worth reading too. This series started with one narrator, and switched to another midstream. Generally a risky move, since each narrator will have a different interpretation of the same characters and their voices, which can make for a jarring difference from one book to the next. Fortunately, both narrators did an excellent job with their respective books, so I can’t really complain. Especially since it’s been so long since I read the first two titles in the series. Nan Gurley did a great job of giving voice and emotion to the characters in this story. I thoroughly enjoyed the listening experience and would highly recommend it. There’s something special about this book. The story has some thematic and structural similarities to the author’s classic bestseller, Redeeming Love, but dare I say it? I like The Masterpiece even better. Maybe it’s my partiality for contemporary stories? Maybe it reflects the author’s growth over her career? Whatever the reason, this story and these characters have found a place among my all-time favorites. Their character arcs introduce gritty bits of reality into the story and require a lot of healing and growth over the course of the book, but their journeys along the way present a beautiful image of God’s love and redemption. The gospel message is discussed in the story, but its introduction felt natural to the plot, and I’m glad the author didn’t shy away from addressing the subject. The romantic storyline is complicated by the hero and heroine’s backgrounds and by Roman’s initially brooding attitude. I enjoyed seeing the gradual development of the hero and heroine’s relationships with each other and with other characters in the story, and how all those relationships interacted in bringing about a satisfying conclusion to the story. Overall, a sweet romance interwoven with meaningful character development throughout. I highly recommend this title for fans of the genre. Susan Bennett gives a professional performance throughout this audiobook. The pacing, inflections, and enunciation in her reading make it easy and pleasant to follow her through the story. Character voices and emotions are subtly distinguished, making it easy to follow who’s speaking, without any of the voices sounding awkward or unnatural. I highly recommend the audio edition. I borrowed this audiobook from my local library. I was not expected to write a review, but wanted to share how much I enjoyed listening to the book. Length: 7 hours, 20 minutes. Unabridged. THE HUNT IS ALMOST OVER. Casey Cox is still on the run after being indicted for murder. The hunt that began with her bloody footprints escalates, and she’s running out of places to hide. Her face is all over the news, and her disguises are no longer enough. It’s only a matter of time before someone recognizes her. This is the third and final book in a series I’ve been eagerly following since the first title, If I Run was published. The hero and heroine continue to be complex, loveable, and believably portrayed. And the villain reveals himself to be even more the kind of dangerous psychopath readers will love to hate. Suspenseful, thought-provoking, and romantic in turns, this installment thoroughly lives up to the storyline’s potential, and brings Casey’s nightmarish circumstances to a satisfying conclusion. After finishing all three titles in the series, I would say I highly recommend them all. Just be sure to read them in order, as they build upon each other to create a larger unifying story arc, beyond the smaller arcs of the individual stories. Kate Rudd, the narrator from the second book in this series returns to read this third installment, and does a great job of it. The reading sounds friendly and personable, while incorporating appropriate levels of urgency throughout. And the dialogue is spoken in voices well tailored to the characters speaking. I highly recommend the audio edition to those readers who appreciate a good audiobook. 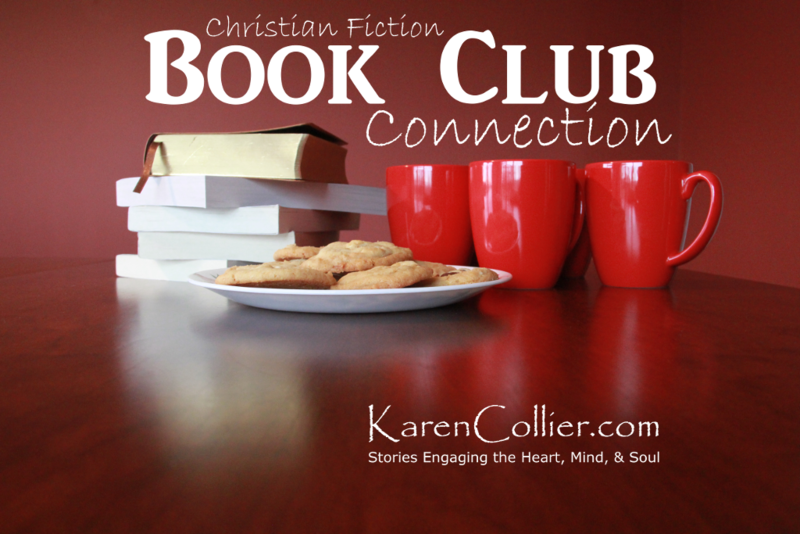 Welcome to the April 2018 edition of the Christian Fiction Book Club Connection. Thanks for stopping by! Whether you’re a pastor or ministry leader thinking of forming a book discussion group at your church, a current member of a book club, or simply a fan of Christian fiction hoping to connect with other readers, you’re in the right place. Please consider subscribing to my blog so you won’t miss future posts. The ACFW Book Club‘s April selection is Blow Out the Candles and Say Goodbye by Linda Glaz. You can subscribe to the group’s e-mail list now, by following the instructions on their Web site, to be sure not to miss any announcements or discussion questions. By the Book is an in-person book discussion club that has introduced an online Facebook-based discussion option. To join in online, like the By the Book Facebook page, and be sure to check back there periodically for any discussion that may not have made it into your news feed. April’s selection is The Masterpiece by Francine Rivers. For April, the Christian Fiction Devourers group on Goodreads is discussing Just Look Up by Courtney Walsh AND The Five Times I Met Myself by James L. Rubart. Grab your copies and head on over to the discussion forum to check in with others who are in the midst of reading these books. The Fans of Amish Fiction Goodreads group discusses one Amish fiction title per month. The selection for April is Love Still Stands by Kelly Irvin. To join in, visit the group’s online discussion board.